If you have any damp or mold in your home, you should find the cause right away as it can have an effect on your health. With that being said, prevention is much better than solution, so we’re on hand with 10 simple tips to help you to prevent damp and mold from occurring. Not only is damp and mold unsightly, but it can be a pain to get rid of. Although you might not be ready to send out in order to prevent it, you’ll thank us in the long run if you take our advice. Damp and mold are caused by excess moisture, whether this is from leaking pipes, rising damp or rain seeping through windows and doors, it’s often something that you might not realize straight away. So, in order to keep you safe and your home in tip-top condition, we’re on hand with simple precautions you can put in place to avoid. Every time you put on a load of washing, two liters of water is emitted into the air within your home. It goes without saying, if that’s not vented correctly, over time it will likely lead to damp and mold. It might seem like a bit of a headache, but it’s most definitely worth doing! If you lack ventilation in your bathroom or utility room, you might find that the humidity levels are higher than the ideal. If this is the case, you should consider investing in a dehumidifier to control these levels and extract any excess from the air. It’s also worth mentioning that if you use a humidifier for various reasons, it’s important to monitor levels in this case also. If you already have mold or damp in your home, an air conditioner won’t help to get rid of it, but they can help to keep it at bay. Air conditioners have a number of uses that can help keep the air quality and humidity in your home at an optimal level. Whether that’s keeping you warm in cooler months, cooling you down in warmer climates, preventing airborne allergens or lowering humidity, they are a solid investment. Weather permitting, you should always try to dry any clothes outdoors to prevent any excess moisture from building up inside. If you can’t dry your clothes outside, try airing them out in the bathroom with the window open or extractor fan on. Whilst you’re cooking up a storm, you should ensure that you cover pans with a lid to reduce any moisture from boiling water circulating. You should also use an extractor hood or fan above the cooker if you have one. It’s worth noting that you shouldn’t turn these appliances off immediately after cooking moisture can still be in the air. Instead, you should leave the extractor on for 15 minutes to clear any humid air. If you don’t have an extractor fan in your bathroom or kitchen, the two most common places for moisture build up, you need to make sure you’re removing any moisture that may have settled. If you’re not drying up damp areas regularly, this will quickly turn into mold if left untreated. Granted, cleaning isn’t the most exciting task in the world, but it’s better than treating mold! If you overfill your cupboards, you’ll be creating a breeding ground for mold without even realizing because of the lack of ventilation and air moisture trapped inside. If you notice your clothes are smelling a little musky or feeling damp, this is a sure sign that you need to declutter. Ideally, you need to ensure that your furniture is at least 50mm away from the surrounding walls in your home to allow the air to circulate properly. 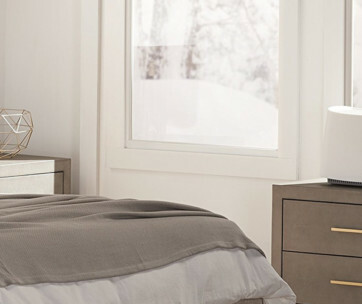 It’s best to ensure that items such as headboards and wardrobes are placed directly against internal walls as they are less likely to cause any damp and mold problems. If your home is often quite cold, it’s likely that surfaces are more prone to condensation build up. As well as heating your home so it’s nice and toasty, you should also take measures to ensure that it’s energy efficient to save you a few dollars. If you don’t already have them, you should consider investing in insulated walls and double-glazed windows to prevent any heat from escaping from your home. Of course, you can invest in gadgets like dehumidifiers and AC units, but sometimes you just need to air out your home with a little bit of fresh air. If you’re lucky enough to live in a warmer climate, you should crack your windows a little to improve the ventilation in the room. In short, to prevent the build-up and damp in the air, you need to ensure you’re keeping your home clean, opening the windows when you can, avoid over cluttering cupboards and make sure air is able to circulate effectively. 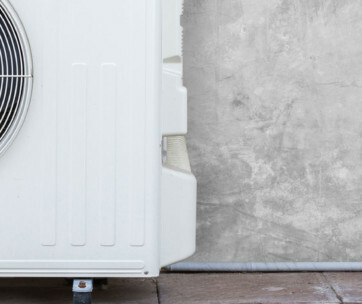 If these free hacks aren’t enough to control the moisture inside your house, you need to monitor the humidity and determine where your money is best spent if you’re going to invest in any appliances to control the air. As we mentioned earlier, you might not be too keen on parting with your hard-earned cash but in the long run, it will be cheaper and easier than dealing with damp and mold. After all, you can’t put a price on health or a happy home!